Ryo as a somewhat heavy character throughout KOF who makes more use of defending/invading one position instead of constant movement, relies on powerful hits and zoning. His normals are some of the most powerful and effective in the game, particularly st.C/D, especially D which makes for great follow-ups. He can be very beastily in the right hands, ending matches with fewer hits than most characters deal out, but he doesn't have as many long-string combos as many others as well. The Jodanuke (f.B)/Gedanuke (df.B) parries give Ryo's defense a level up that allows for excellent punishes with good reads. He can do decently if up against a projectile-happy character, up to a certain point, but needs to close the distance as his Kohken (qcf.P) doesn't reach across the screen. It shouldn't be forgotten that his EX Ryukohranbu (qcf,hcb.AC) will whiff most projectiles in the game. His screen-crossing combos might take some time to harness, but it's a great reason to utilize him as an anchor. If you're prepared to zone against a non-fireball character, he's decent enough on point too. s.A 25 damage, chain/cancel-able, hits mid. A safe and neutral positioning jab, that is good for stopping hops. If whiffs on crouching opponents by itself that aren't in block or hit stun. +1 frame on block. s.B 30 damage, cancel-able, hits mid. A safe and quick front kick that is far range and cancel-able. Neutral on block. far C 80 damage, whiff/cancel-able, hits mid. Nice ranged hook that has good damage and cancel-able properties. Also good for stopping incoming hops at a farther range than s.A. -4 frames on block. s.D 70 damage, whiff/cancel-able, hits mid. Looks like a low kick, but it hits mid. It has great horizontal range despite its animation. A great poke to use at close range and to start combos with. It's whiff cancel-able properties makes it rather safe to throw out especially since his upper body is vulnerable during the animation. Even though it has negative frames on block, Ryo is pushed back a fair amount of distance to avoid many punishment attempts. -7 frames on block. cl.C 70 damage, cancel-able, hits mid. A safe, quick uppercut to the chin. Compared to his s.D, this punch is obviously needed to be activated up close, while s.D can be used far and up close. It is a bit safer on block than s.D but it's pushback is much more closer to the opponent. cr.A 25 damage, chain/cancel-able, hits mid. Same as his standing A, but crouching. Good pressure when in close range. +2 frames on block. cr.B 30 damage, chain-able, hits low. Great low poke, a good starter for his combos, and is safe on block. It also links into his d.C (crouching heavy punch). +2 frames on block. cr.C 70 damage, cancel-able, hits mid. Good for stopping jump-ins. -10 frames on block. cr.D 80 damage, whiff/cancel-able, hits low. A wide ranged sweep that is cancel-able which makes it very safe to poke around with and to use in conjunction with his qcf+P or his df+B to cancel the recovery if it sweeps the opponent. -4 frames on block. j. A: 45 (40) damage, hits overhead. A short ranged jumping elbow. Good for air-to-air or even ground-to-air to interrupt regular and super jumping opponents. It can whiff on crouching opponents if performed early in the jump or hop. 5 frames of start-up. j. B: 45 (40) damage, hits overhead. A short ranged jumping knee. The hitbox is pointed down more diagonally than his j.A, which can be good for offensive hop pressure or full air to ground jump-ins. It can also cross-up opponents too. Similar to j.A where it can whiff on crouching opponents if performed too early in a jump or hop. 5 frames of start-up. j. C: 72 (70) damage, hits overhead. A powerful diagonally downward aimed jumping punch. Good for air to ground jump-in attacks. This punch can also cross-up opponents. 6 frames of start-up. j. D: 79 (68) damage, hits overhead. A long ranged flying kick that is aimed at a diagonal angle. This is one of his longest ranged jumping normals. It's a great jump-in attack, and can cross-up as well. CD: 75 damage, whiff and hit cancel-able, hits mid. Ryo delays a powerful standing (but short ranged) back hand punch aimed at the torso. Good for staggers while on the offense, and pressure in the corner; especially since you can cancel it on block and on hit. Neutral on block. j. CD: 90 (80) damage, hits mid. Ryo performs a jumping sideways karate chop. It can be useful in air-to-air situations but it must be performed rather early because of its slow start-up. Also be careful if it misses at the apex of his jump because he can be punished on the way down. 13 frame start-up. Tomoe Nage = (b/f+C/D) close: 100 damage, cause a hard knockdown. 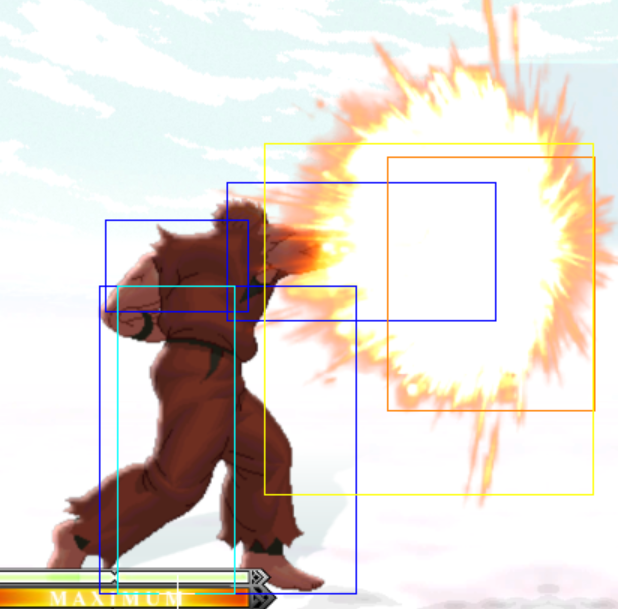 Ryo throws the opponent almost a full-screen distance away. The distance does makes okizeme wake-up options a bit difficult setup but it isn't impossible if you are quick enough. Hyochuwari = (f+A): 70 (65) damage, super cancel-able only, hits overhead (mid if canceled into). This is Ryo's standing overhead which is a moderately slow karate chop. It's super cancel-able properties can make this standing overhead very scary towards opponents on their wake up, but try not to be too predictable with it against players who have very high defensive awareness. You will also see this attack used as a common starter for his HD combos or even used by itself into HD mode. If used in a pressure string, keep in mind that he does get pushed back on block if a normal is placed in front of it (example, cl.C, f+A or s.D, f+A), but can be punished with any attack that can reach him before he recovers. Jodanuke = (f+B) No damage, cancel-able, counters mid and overhead attacks. Ryo's parry is a very useful defensive and offensive tool which can help him negate mid and overhead attacks as well as whiff cancel out of his cancel-able normals decreasing their recovery. It helps strengthen his defensive and offensive options because he can cancel out of his parry into (after an attack has been absorb) any of his moves. The disadvantages to his parry is that it does have slow start-up, it does not parry multi-hitting projectiles (it does parry multi-hitting special moves, like EX Iori's dp+C) and you cannot cancel out of it by itself if whiffed. It is also susceptible to low attacks and instant command throws if the player is using them too repetitively or if canceled from a normal attack too closely. Gedanuke = (df+B) No damage, cancel-able, counters low attacks. Similar to his standing parry but counters/absorbs low attacks with mid attacks from a crouching opponent or ground skimming projectiles (ex Iori's qcf+P). You might mistakenly whiff into this move if you are trying to attack and pressure an opponent with crouching light kick (cr. B), so be aware of your inputs. The two parries have slightly different parry windows, so be sure to check the frame data tables for the exact numbers. Ryo is very open to standing mids, overheads, jump attacks and throw during this parry move, so use with caution and proper judgement. Kohken = (qcf+P) A short ranged projectile that functions as a flash punch so to speak. It can be used for both offensive and defensive measures and it is one of Ryo's more trustworthy moves. The A version of Kohken causes Ryo to swing his arm forward quickly while remaining stationary on the ground. This version can function as a safe anti-air tool as well. The C version causes Ryo to travel forward a little bit, but it can still be canceled from heavy normal moves. The A version of Kohken is 0 frames on block. The C version of this move is -6 on block, but it is still very hard to punish, due to its push back. The Kohken in general offers a rather a generous hit box, allowing Ryo to exercise his momentum. (EX) = qcf+AC Ryo will launch his projectile very quickly while traveling forward. Does generous amount of damage on hit, covers a lot of distance and can be a very powerful pressure tool. This version of Kohken will cause a knockdown on hit. Use this move in moderation. Keep in mind that this version can be used for frame trapping the opponent, as it leaves Ryo in plus frame (+4 frames to be precise). Koho = (dp+P) A traditional dragon punch. Even though, the move itself has decent priority, it does not cover that much range. The A version of this move has slight invincibility on start up and Ryo will travel slightly into the air. The C version has a lot more invincibility on start up, but will cause Ryo to travel further upwards, making the move far more unsafe. Please, utilize this move with caution. (EX) = dp+AC This version comes out a lot faster and stronger. This version also has a little more invincibility on its start up. Hienshippukyaku = (hcb+K) Ryo leaps forward into the air to perform a spinning kick onto his opponent. This move is not safe on guard, but can be used as an anti-air and is used in various combos. Both versions of this move are unsafe on block and are punishable. The B version of this move will make Ryo travel a short distance but has very fast start-up (5 frames) which can be ideal for punishing moves that have bad recovery. The D version of hcb+K will cause Ryo to travel further and a little higher which is good for the sake of combo continuity. Also, keep in mind that the second hit of the D version of this move will whiff crouching opponents, causing Ryo to travel over his opponent making him even more unsafe. (EX) = hcb+BD Ryo travels further and faster, hitting the opponent (even while they are crouching) twice for extra damage. This move can be easily comboed afterwards. This version can be good for adding more pressure onto the opponent, especially in the corner. This move is still relatively unsafe on guard, however. Zanretsuken = (f,b,f+P) Ryo performs a volley of punches, while remaining stationary. If any of the punches connect to the opponent, Ryo will enter a full punching animation that will lead to an uppercut, causing the opponent to reel upwards into the air. This move is very good to utilize in combos but is very unsafe on guard. The overall range isn't very great (compared to past KOF games), so it would be hard to lure and trick opponents into this move if they are jumping and rolling 3/4 of the screen near you. The light punch A version causes a hard knockdown while the heavy punch C version can be used to juggle the opponent afterwards while they are falling in the air. (EX) = f,b,f+AC Ryo will start punching a lot faster with great priority. Although this version is also unsafe on guard, it will do a lot more damage and will leave the opponent in a juggle state. Ryo can combo after this version of the move. This is a very good move to utilize when performing more damaging combos. Hit Detection: Mid but the first few punches will whiff on crouching characters (except Raiden and Maxima). Ryukohranbu = (qcf hcb+P) Ryo will perform a ranbu super move. Ryo will rush towards his opponent. When he connects with the opponent, he will perform a barrage of attacks, ending the combo with his Koho. The start up of this move is a bit slow, but it does have decent priority. Use this move with caution. Ryo will travel a little beyond mid screen. This is a very good DM to utilize when completing combos or if you are trying to counteract an opponents movement. (EX) = qcf hcb+AC This version does far more damage and comes out a lot faster than the regular version does. This version also has invincibility on its start up as well, which can make it a rather viable anti-air tool. Haohshokohken = (f,hcf+P) Ryo will hurl a wide projectile towards his opponent. It is possible to jump over it but extremely risky. Ryo can alter the speed of this projectile depending on which punch button is pressed. If the A version is used, the projectile will travel slower. If the players uses the C version, the projectile will travel forward very quickly which is good for punishing and overriding the opponents projectile. Tenchihahoken = (qcfx2+AC) Ryo will power himself up and perform a devastating punch attack to the opponents mid section, sending them reeling backwards for a hard knockdown. Very damaging and good priority. This move has rather short range, however. It is possible to use this move after conducting Ryo's high or low parry (f+B or df+B) because he is at a frame advantage. This move is very good use when finishing a high damaging combo or if the opponent continues to recklessly apply their offense. This move can also work as very well to break the opponents guard gauge. If used by itself, randomly, and up close, the opponent can simply evade it by rolling on reaction. cr. B can be exchanged for st. A. The f,b,f+A ender gives the opponent a hard knockdown. cr. A can be changed for st. A. This combo causes a hard knockdown. The dp+C can be omitted in this combo if you feel that it will miss but the damage will be lowered. One of Ryo's most effective weapons is his Kohken (qcf+P). This move sets up a good deal of offense and is a great defensive tool. Though Ryo's fireball is not a fullscreen forward progressing projectile, this is in no way a weakness. When using Ryo, consider his projectile to be a shell that expands and contracts accordingly to the right situations, and Fireball A/C/EX versions maintain it. 1. The fireball itself has a much larger hit box than it appears, especially when using the A version, which looks deceptively small, often catching as an anti-air. 2. The fireball has a tech-able knockdown on any version, which is huge in resetting your position or transitioning into rushdown. 3. Blockstun and recovery on the A version is really good, especially in the corner to setup mix-up situations. Blockstun on C version is also great long distance, but can be punished with a fast move if done at close range. However, if you whiff C version Kohken, it can be punished even from long distance from plenty of characters (K' comes to mind), and this is the version players are hoping to jump over or roll through. 4. EX version comes out really fast, has fast recovery and is also safe on block, so use this move to throw the opponent off from reading patterns since it's not expected. Now with all these uses for the fireballs it sets up everything from being easier to predict when to parry, mix in uppercuts, set up jumps for anti-airs, or super, EX super. He also has a very effective fireball trap in the corner with A, EX version, and even C version with particular spacing to bait the opponent to stick something out, then follow up with a parry or uppercut. The downside though is that against maybe one particular character (Chin!!) the fireball game becomes a dangerous game to play due to his (Chin's) low to the ground size. His moves make him invulnerable to the fireballs since majority of the hit box is lower middle to high and makes it really easy for Chin to penetrate Ryo's defense. 2.) st. A > cr. C (L) - 2 frame gap between st. A and cr. C. St. A whiffs on crouching opponents, except on Daimon, Raiden, and Maxima. 3.) st. A > st. D - 4 frame gap between st. A and st. D. St. A whiffs on crouching opponents, except on Daimon, Raiden, and Maxima. 4.) cr. A > cl. C (L) - 2 frame gap between cr. A and cl. C. 5.) cr. A > cr. C (L) - 1 frame gap between cr. A and cr. C. 6.) cr. A > st. D - 3 frame gap between cr. A and st. D. 7.) st. B > st. A - 4 frame gap between st. B and st. A. St. A whiffs on crouching opponents, except on Daimon, Raiden, and Maxima. 8.) st. B > cr. A - 4 frame gap between st. B and cr. A. 9.) st. B > cl. C - 4 frame gap between st. B and cl. C. 10.) st. B > cr. C - 3 frame gap between st. B and cr. C. 11.) cr. B > cl. C (L) - 2 frame gap between cr. B and cl. C. 12.) cr. B > cr. C (L) - 1 frame gap between cr. B and cr. C. 13.) cr. B > st. D - 3 frame gap between cr. B and st. D. 14.) qcf+A > st. A - 4 frame gap between qcf+A and st. A. St. A whiffs on crouching opponents, except on Daimon, Raiden, and Maxima. 15.) qcf+A > cr. A - 4 frame gap between qcf+A and cr. A. 16.) qcf+A > cr. B - 4 frame gap between qcf+A and cr. B. 17.) qcf+A > cr. C - 3 frame gap between qcf+A and cr. C. 18.) qcf+AC > st. A - 0 frame gap between qcf+AC and st. A. St. A whiffs on crouching opponents, except on Daimon, Raiden, and Maxima. 19.) qcf+AC > cr. A - 0 frame gap between qcf+AC and cr. A. 20.) qcf+AC > st. B - 2 frame gap between qcf+AC and st. B. 21.) qcf+AC > cr. B - 0 frame gap between qcf+AC and cr. B. 22.) qcf+AC > far. C - 3 frame gap between qcf+AC and far C. 23.) qcf+AC > cl. C - 0 frame gap between qcf+AC and cl. C. 24.) qcf+AC > cr. C - -1 frame gap between qcf+AC and cr. C.
The Ryo player needs to focus on getting in close, while carefully adjusting to the opponents play style. There is not much he can do at further ranges but he does have a number of ways of getting in. It is possible use f,hcf+P projectile and carefully timed movement (rolls, jumps, high jumps, and hops) to discourage reckless projectile zoning. Ryo can also use f+B and df+B to parry even projectiles as he draws himself closer to the opponent. Ryo employs the "Advancing Wall of Doom" approach - the player can gradually advance towards the opponent and prepare to catch them off guard. It is best to stay at the mid to close range with a character like Ryo because from those two positions he has a lot more options, allowing the player to exploit his game play better. If the offensive player is advancing towards Ryo from the full screen, Ryo can use his cr.C (or neutral jump/f+B parry) to anti-air the opponent then draw himself close to the opponent for some offense and/or possible mix ups. Ryo can use qcf+A or C to keep opponents out (preferably as a pre-emptive anti-air). If the opponent goes for blatantly obvious jump in, Ryo's st.A, cr.C or a neutral jump normal will cripple the opponents offense from the air. Ryo is noteworthy for having very good normal moves so this will play an important role in the neutral game at this range. There are number of getting closer to the opponent, such hop/hyper hop forward jumping normal for forcing the opponent to the defense and hit confirming into a potential combo. Ryo's qcf+A and qcf+C are both safe on block, so use these projectiles in moderation as you fight the opponent. Ryo still should be getting in close because up close is where Ryo excels at as well. Ryo can also deal with the opponent offensive movements with his parry (f+B and df+B) = make very careful use of this when you are making a read and if you know the opponent is going to do something reckless. Ryo needs to be the one forcing the opponent into a tight spot. He also needs to be focused on cornering the opponent at this range, because his big damage, corner lock down, and frame traps become prevalent overtime. From up close, Ryo can use his f+A for confirming into a big time HD combo, sense it is relatively quick and can be somewhat difficult to react to, especially in clutch situations. Ryo's qcf+A is 0 frames (neutral) on block. In the corner, Ryo can perform cl.C, qcf+A and the follow up with DP+C. Ryo's cl.C and qcf+A block string can be used for hit confirm in some scenarios because qcf+A does not have any real recovery. After qcf+A (if the opponent blocks), he can quickly use st.D into qcf+A because st.D come out very quickly. It is also important to keep in mind that st.D is great for meaties and catching opponent on their wake up. Another aspect that Ryo excels at is guard crushing. From up close, Ryo's offense can prove to be lethal because of how hard he hits. At the mid range, Ryo can use cl.C, hcb+B to drive the opponent into the corner a bit more (EX hcb+K helps a lot more as it corner carries opponents and sets a juggle state for more elaborate and damaging combos). Do not use any other special move besides qcf+A or qcf+C because those are his safest options from up close. If the player should use any other special it is important to make sure that the opponent is getting hit by the normal move before then. On block, punish Andy's db~f+A with Ryo's st.D or hcb+B. Stop incoming hcf+K (any button) with st.C or qcf+A or dp+A. On block, outside of it's max range, punish with a dp+A. You can only f+B parry Ash's first fireball of his charge b~f+AC projectiles. It's hard to punish Ash's [b]~f+BD on block, but if you see it coming, you can parry it with f+B. Cancel the last parry hit into a dp+P or a hcb+K. Punish Shen's qcf+A or briefly charged qcf+C with Ryo's crouching C (heavy punch). Use hcb+B, or crouching C to punish Takuma's db~f+K. The EX version of Takuma's db~f+K is safe on block. Practice reacting and parrying Takuma's EX qcf+P. This page was last edited on 15 December 2014, at 20:14.